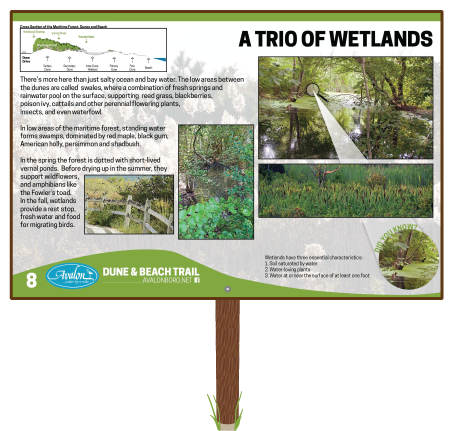 The Avalon Dune and Beach Trail is host to a variety of different wetlands. To the west side of the foredunes are interdune swales, where small wetlands form in the shallow, low-lying valleys between dunes. They are known for their tendency to have high concentrations of wildlife in them. Interdune swales are often freshwater, mostly groundwater fed wetlands with a diverse variety of plant life. They are supposedly formed by “blowouts” in the unvegetated sand causing a ridge and swale topography (McAvoy and Clancy, 1994). A blowout is a small depression formed by wind erosion on a pre-existing dune or other sand deposit. (USGS, 2013) Although these swales are often groundwater fed, the dynamics of the ocean water level drive the plant community that inhabit ​them​. 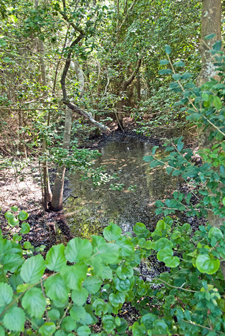 A vernal pond is a temporary condition that forms in small depressions where water gathers during the winter months and dries out during the summer months. They are a particularly important ecosystem on ​this​ barrier island because they serve as critical habitat for sensitive wildlife, in particular amphibians like the Fowler’s Toad. Since they do not remain full throughout the entire year, they cannot support fish species, which are the common predator to many amphibians. 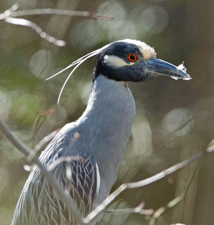 Vernal ponds on barrier islands serve as a critical fresh water source for many species of wildlife and thus are a gathering place for many birds, such as the Yellow-crowned and Black-crowned night heron. ￼The Dune and Beach Trail also has a hardwood swamp dominated by Red Maple, Black gum, and Persimmon​ ​Trees ​that​ are seasonally saturated by snow and rain. They form in low lying areas of the maritime forest. These hardwoods grow slowly and are denser and stronger than most other trees. For an area to be considered a wetland, it must meet three important criteria: wetland hydrology, hydric soils, and hydrophytic vegetation. 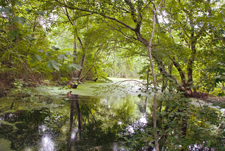 Typically, if an area has wetland hydrology, the soils and vegetation will follow. The key feature in distinguishing wetland hydrology is the difference between the elevation of the water table and the elevation of the land surface. If that distance is 1 foot or less, you most likely are in a wetland. Additional measures of this are how long the water stays in the wetland. The easiest way to discern a wetland is by looking at its vegetation. 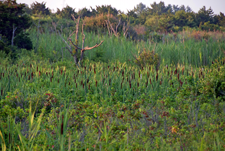 There are certain wetland indicator plants, such as Red Maple or cattails that are quick keys to a wetland. See if you can spot the wetlands on the trail. Remember​, wetlands may not be there when you visit since their ​presence depends on the season and how wet or dry the weather has been.